Almost everyone in Hong Kong have probably used an electronics product from Sony or a bathroom equipped with American Standard sanitaryware at one point but few are aware that both of these famous brands were introduced to the HK market by one family – the family of Chiu Hip-ting (趙協庭), whose Chung Yuen Electrical remains one of the leading electronic retailers in HK nine decades after its founding in 1927 and whose Acme Sanitary Ware has been a leading distributor of sanitary and plumbing fixtures in HK for seven decades since its founding in 1949. Chiu Hip-ting founded Chung Yuen in 1927 (although as a firm it was not incorporated until 1960) and its original location was located at 71 Des Voeux Road Central. At the time, there were few stores dedicated to the retailing of electronics (e.g. Central Radio Service or Wah Mei Electric located at nearby 135 Des Voeux Road being the other well-known retailer and had branches in Shanghai and Canton as well) and electronics products such as radios which Chung Yuen focused on were rare as radio broadcasting did not begin in HK until June 1928 when the government launched English broadcasting service GOW (renamed ZBW in 1929) and Chinese broadcasting service was not launched until 1934 with ZEK. (ZBW and ZEK became Radio Hong Kong in 1948 and RTHK in 1976). By 1949, Chiu Hip-ting and Chiu Kit-tong (趙傑堂) were directors of the firm but the leadership of Chung Yuen had shifted to Hip-ting’s son Chiu Oi-wah (趙靄華) who was taking the firm into new directions as general manager. That same year, the family expanded into the sanitary ware business with the establishment of Acme Sanitary Ware (to be covered in greater details in the next section) In 1952, Chung Yuen expanded into the sales of music records. In the 1950s, the radio business in HK took off with the launch of Rediffusion in 1949 and Commercial Radio in 1959 on the content side and the launch of low-cost transistor radios from Japan in the mid-1950s on the hardware side. In the late 1950s, the Chiu family managed to secure the HK distributorship of two of the top Japanese radio brands – Sony (through Chung Yuen in conjunction with Tsang Fook Piano) and Crown (through Acme). As noted in an earlier article about Peter H.T. Woo, Sony helped launched the HK electronics industry by outsourcing its radio assembly to Woo’s Champagne Engineering in 1958. Sony did not award the distributorship of Sony products in HK to Peter Woo (that partnership was also shaky as it dissolved within 2 years) but Chung Yuen was undoubtedly a much bigger name in electronics distribution and Tsang Fook was also the top distributor of music-related products before the emergence of Tom Lee so the decision to appoint Chung Yuen and Tsang Fook made a lot of sense. By 1959, the membership of the industry group chaired by Chiu Oi-wah – Radio Association of HK – had exceeded 300 and Chung Yuen’s distribution of Sony was very successful thanks to aggressive marketing which included sponsorship of Wah Kiu Yat Po’s top 10 HK stars contest in 1960. In 1961, Chung Yuen and Tsang Fook formed Fook Yuen Electronic Co (taking a character from each of its names) to act as the sole distributor of Sony products in HK, which by then included transistor TV sets. Business was very successful from the start as evidenced by the Chinese New Year banquet Fook Yuen hosted for HK retailers of Sony in 1963 which was attended by over 1000 guests. By the 1960s, Chung Yuen had relocated to 105 Des Voeux Road and in 1973, a relocation sale took place as that building was being re-developed. In 1974, Chung Yuen opened its first Kowloon branch at 574 Nathan Road in Mongkok. When the new building opened at 105 Des Voeux Road in 1977, the Chung Yuen store which occupied the first three floors was opened by the visiting Sony president. By the 1970s, Chiu Oi-wah’s sons Peter Chiu Chit-ho (趙哲陶, 1932-) and John Chiu Chung-kwong (趙重光, 1947-) had assumed leadership roles in the family business while another son Dr. Jonathan Chiu Kai-shun (趙啟迅) who studied medicine in Ireland practiced medicine in HK. 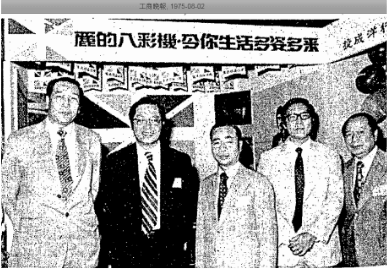 The Chiu family was supported at Chung Yuen by long-time staff members such as Lau Mo (劉瑁) and Cheung Lap-kee (張立基) who worked at the firm from 1970 until his retirement in 1982. The relationship with Sony deepened in the 1970s, with Sony buying out 40% of Fook Yuen from Tsang Fook in 1973. The partnership also expanded beyond electronics as Sony emerged as a global conglomerate and expanded its product offerings. 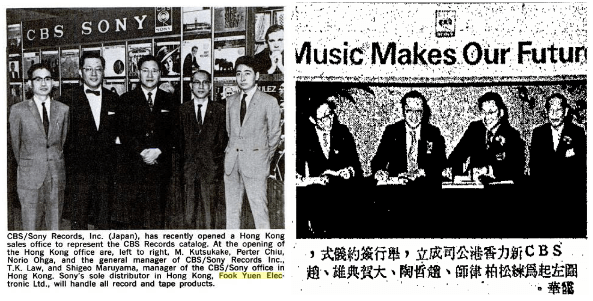 In 1970, Fook Yuen became the HK distributor of record and tape products of CBS Records and CBS Sony. In 1975, Fook Yuen was appointed HK and Macau distributor of industrial adhesive products produced by Sony subsidiary Sony Chemicals. In 1978, CBS/Sony HK Ltd was formed with the Chiu family’s Avon Ltd (incorporated in 1967) and CBS Sony as shareholders and Peter Chiu as chairman. In addition to distribution of records published by CBS Records and CBS Sony, the new venture also began the production of local music and established a US$1.1 million manufacturing plant in Yau Tong capable of producing 6000 disks, 3000 cassette tapes and 10000 record jackets per day, the largest facility of its kind in HK and best equipped in Southeast Asia at the time. 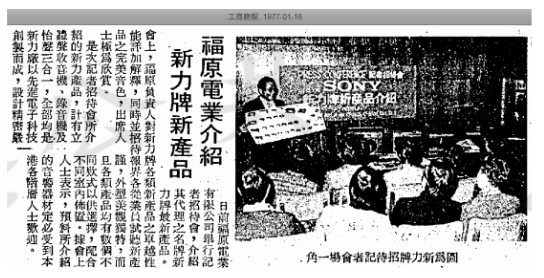 In 1982, Sony founder Akio Morita (who had by that time became one of the world’s most celebrated businessmen) visited HK again for the first time in 7 years to talk about latest technology such as compact discs at an Amcham event. The reception hosted by the Chius at the Mandarin was attended by the Who’s Who in HK business including Sir Y.K. Pao, Sir Kenneth Fung, Sir Tang Shiu-kin, HSBC taipan Michael Sandberg and Jardine taipan David Newbigging. During his speech, Morita mentioned that he did not need to come to HK for seven years because business was well taken care of by the Chius. That year, Chung Yuen still only had 2 stores but that strategy changed later in the decade and by 1991, branches were also added in Prince’s Building in Central, Ocean Centre in Tsim Sha Tsui and 575 Lockhart Road in Causeway Bay. The music business also grew in the 1980s and local singers who worked with the CBS/Sony label in the 1980s include Ken Choi, Samantha Lam, Jenny Tseng and Sandy Lam. In 1983, CBS/Sony purpose-built the Avon Studios (雅旺錄音室) on two floors at the Chiu family’s Acme Building. Designed by famous sound engineer Tom Hidley, the studio was and remains one of the most advanced recording studios in Asia with other record labels such as Polygram, Warner Bros and Rock as clients in addition to Sony. After Sony acquired CBS Records in 1988, CBS/Sony HK was renamed Sony Music Entertainment (HK) Ltd in 1990. In 1994, Sony acquired the remaining 60% of Fook Yuen and as a result Fook Yuen became a wholly owned subsidiary of Sony. The same year, the Chiu family acquired the Avon Studios from CBS/Sony and continues to operate the studio to this day. Today, Chung Yuen with its 13 stores in major shopping centers across HK, Kowloon and New Territories and the ground floor of its Acme Building plus its online shopping presence remains one of the leading electronics retailers in HK. In 1949, the Chiu family established Acme Hardware (益美五金) as an outlet for the retailing of sanitary fixtures, fittings, plumbing hardware and pipes and the business was formally incorporated as Acme Sanitary Ware Co Ltd in 1956. By 1964, Acme was successful enough to build its own Acme Building (益美大廈) at 22-28 Nanking Street in Yau Ma Tei and its own warehouse in Kwun Tong. Some of the products Acme represented in the 1960s included kitchen sinks from English Stainless-Steel Sink Co Ltd, sanitary fixtures from Johnson & Slater and the Crown brand of electronic products from Japan. In 1963, Acme acquired the American trading firm of Landis Brothers, which was founded in HK in 1947 by Robert B. Landis and his brother W. Newton Landis (also known for being a stamp collector) from Philadelphia. 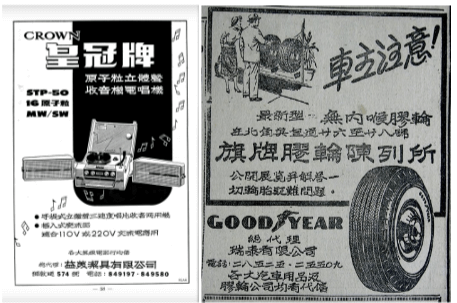 The firm represented a long list of American products in the Far East ranging from Goodyear tires (好時年), Stanley Works, Wyandotte Chemical, American Screw, Crescent baking powder, VO5 shampoos, Rheingold Beer (in 1950, the firm was the 6th largest brewery in America and had 35 percent of New York market, bought by Pepsi in 1964), Universal Watches, Briggs Tone water paint and auto lacquer paint, National Batteries to steel furniture, road rollers and motor graders. In the late 1940s, it operated out of Queen’s Road Central with directors aside from the Landis brothers include managing director A. John Bush, Standard Oil comprador Wong Sik Pun (best known for his kidnap later in the 1950s) and Chan Wing-hun of Goddard (see article on David Miao). In 1959, Landis Brothers started the second carpet maker in HK – Hong Kong Oriental Rug Co with the British trading firm Gilman. Started out with two foremen, within a few years they had a 15000 sq ft factory in San Hui in Tuen Mun with 200 workers and showroom at the newly opened Ocean Terminal. Landis Bros at its peak had 10 branch offices across the globe and the link between Acme and Landis was a marital one as Peter Chiu married Ip Nga-yee (葉雅宜), the daughter of Landis executive Ip Kun-im (葉觀炎), who succeeded Bob Landis as head of the firm after the latter retired in 1963 (although Landis stayed on as honorary chairman until the 1980s while Ip died in 1973). Today, Landis primarily focused on the distribution of adhesive products by Dexerials, the successor firm to Sony Chemicals. In the 1970s and 1980s, Acme became a major plumbing contractor in HK in addition to distributor of sanitaryware. The firm was involved in the bathrooms of many major hotels, residential and commercial buildings, schools in HK and China and was one of the first HK plumbing firms to enter mainland China after 1979, supplying American Standard to Jinling Hotel in Nanjing in 1981. It was appointed sole distributor for American Standard in HK and Macau in 1985 and has been one of the biggest distributors of American Standard products in the world. In 1991, the Chiu family took its sanitaryware business public in the Stock Exchange of HK under the name of Acme Landis Holdings (益泰集團). In 1993, Acme opened its office in Shanghai and invested in A-S China Plumbing Products, the Chinese operations of American Standard. The directors of Acme Landis included chairman Peter Chiu, his son David Chiu Chun-leong (趙俊良) and his brother John Chiu who was managing director. At the height of the dotcom bubble in 2000, US venture capital firms H&Q Asia Pacific and JH Whitney & Co acquired the majority control of Acme Landis from the Chiu family and renamed the listed entity i100. The listed entity changed hands a few more times and is now known as Eminence Enterprise and the Chiu family bought back the Acme and Landis operations. Aside from Chung Yuen and Acme, Chiu Oi-wah was also a director of the perfume manufacturer and property firm Kwong Sang Hong and the former head of Kwong Sang Hong – Fung Man-kui (grandson of founder Fung Fook-tin) also sat on the board of Acme Landis from 1991-1993). Outside of his business, he was involved with the Radio Association of HK and the Chinese General Chamber of Commerce for decades. His family donated the YWCA Chiu Oi-wah Nursery School in Cheung Sha Wan in his memory and his fifth brother Chiu Hark-chuen (趙克銓) married the eldest daughter of Ho Heung-min (何享綿) of Ching Cheung Weaving & Dyeing Works in 1959. This article was first posted on 12th April 2019.